A classic! 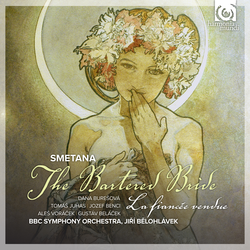 And yet Smetana was thoroughly irritated by the torrents of praise lavished, in the last years of his life, on this Bartered Bride which had been categorically rejected at its premiere (1866) by a Czech public waiting to hear the genuine national opera. Four versions of the work later, and after many critical complaints (sometimes it was found too long, sometimes too short), it was realised that the composer had given birth to a genre built to last. For nearly 150 years now, The Bartered Bride has triumphed in opera houses all over the world; and in the present recording it is in the hands of a true team of experts.